In a show of direct control of its armed forces, Chinese President Xi Jinping assumed the new role as commander-in-chief of the military. More than 3,000,000-strong Chinese soldiers, both active and reserve, are now headed by Commander Xi, in what military observers said was a display of force by the country's most powerful leader in decades. Xinhua revealed on Thursday that Xi assumed the military position of commander-in-chief of the Joint Operations Command Center. Xi visited the Joint Battle Command of the PLA with the media and urged the soldiers to be "absolutely loyal and courageous and capable of winning wars." The Joint Battle Command was created at the time of the raging territorial tensions among claimant-countries in the South China Sea. It was formed last December to streamline China's armed forces and special commands like the PLA Rocket Force and Strategic Support Force. Dressed in military camouflage complete with insignia, political and military analysts said Xi's appearance was a display of strength and strong leadership aimed at Beijing's rivals. Xi is currently China's president, chairman of the ruling communist party, head of the Central Military Commission (CMC), and now the overall commander of the streamlined armed forces. Analysts said Xi's new image and title were meant to send the message to his potential enemies that he not only heads political and administrative positions but more importantly, he is now the commander-in-chief of the world's largest military. 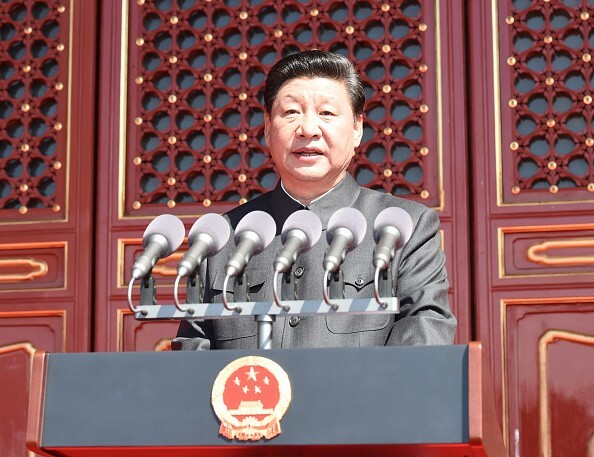 "Xi's move reflects the thinking that political power grows out of the barrel of the gun and signals his effort to consolidate not only the Communist Party's command of the military but also his own status as China's highest leader," said Zhang Lifan, a political analyst. Political observers said Xi's new title was more "political than military" saying that political power has always been dependent on military control based on Chinese history.